Daisson Hickel is a father, explorer, and entrepreneur. His passion for his family and exploration are intertwined in his daily life. His philosophy is simple; Live Life Charged. Daisson currently serves in the United States Army Special Forces as a Green Beret and has deployed to several countries around the world. He maintains an active lifestyle; constantly balancing time spent with his four daughters and wife Megan Kabat. He has trekked the jungles of Colombia, Ecuador and Honduras and has worked alongside partnered nation commandos in hostile regions of Afghanistan. Daisson lived for two years in an Airstream travel trailer while training Combat Divers in Key West, Florida. Daisson founded the company The Java Can on his second deployment to Afghanistan. His innovated products are inspired from his time serving overseas in difficulty and austere environments. His company promotes travel and exploration while humbling connecting people by sharing a hot drink-the most basic of fellowships. He often approaches difficult situation (and people) with a smile and a cup of coffee. Daisson is an avid mountaineer and skydiver both in the military and off duty. He is also an Open Water Kayak and SCUBA instructor. On his off time, he volunteers his time by teaching young teens outdoor skills as well raising money for wounded veterans. 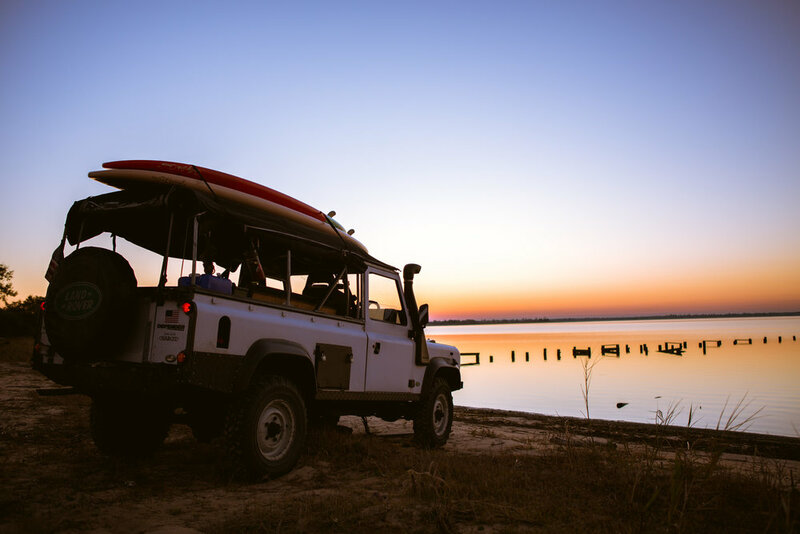 Maggie is a classic 1986 Land Rover Defender 110 HCP and official Mascot for The Java Can. She was bought on May 26th 2017 from a Landy enthusiast from South Florida. The feel of driving a Right-Hand Drive (RHD) Defender brought Daisson back to his early Afghan days where he would drive a similar vehicle at Kandahar Airfield. With a 2.5 diesel (Non TDI) under the bonnet (British English for hood) and a top speed right at 70 MPH (going down hill) a “Going nowhere fast attitude” quickly became the norm. Maggie perfectly fit the laid back attitude of the “journey is more interesting than the destination”. She now lives in Santa Rosa Beach, Florida where she can be seen cursing down the scenic highway 30A. A number of functional cosmetic modifications where then added. Bench seat where installed to transport the 4 littles. An exterior locker was also added on the ride drivers side. She was named after the famed actress and singer Martha “Maggie” Ray (1916-1994) who was made an honorary member of the Special Forces. 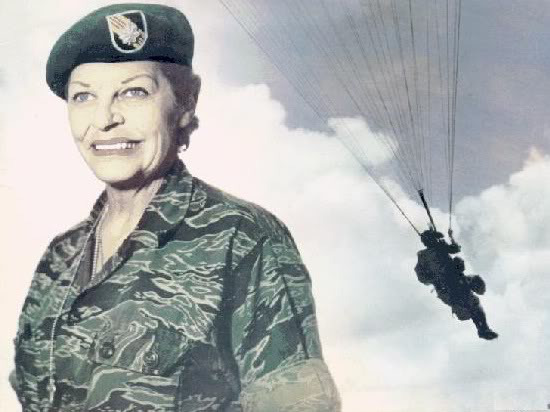 She had received her prized Green Beret and given the title of Lieutenant Colonel from President Lyndon B. Johnson, himself. When she died a special exception to policy was made so that she could be buried in the military cemetery at Fort Bragg, North Carolina. From 1964 to 1975, Martha traveled from camp to camp in isolated areas throughout Vietnam making eight separate visits. She would stay "in-country" from four to six months at a time--usually at her own expense--to be with the troops she so dearly loved. She used the nurse's aide skills she learned back in the 1930s, and surgical techniques she picked up during World War II to help treat the wounded. Whatever her official nursing qualifications, her assistance was often needed and very much appreciated. Her presence, whether as entertainer or as a nurse, helped to make life bearable for so many enlisted troops and officers. Martha was wounded twice during her visits with the Green Berets. In 1993 Martha Raye was awarded the Presidential Medal of Freedom for her lifetime service to the United States Armed Forces by President Bill Clinton. © The Java Can. All Rights Reserved.